Glide smoothly and quietly across the water. For relaxation, recreation, fishing, etc. Easy to take with you anywhere. Inner tube, tough nylon outer layer and speed valve. Seems expensive to me, is it? Not to be used for navigating creeks then? I'm glad they labeled it so we know what it is. Link just takes me to the website not the product unfortunately. Is it working for others? Link just takes me to the website not the product unfortunately. Is it … Link just takes me to the website not the product unfortunately. Is it working for others? 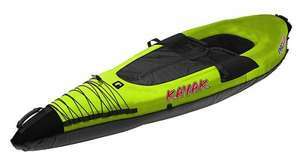 I just put the name of the kayak in the website.... and..... wait for it...... wait for it......... the product appeared! No. Hope not. Just bought 3. Sorry, links don't seem to be working for this retailer. Try searching for product code 34-8922 and it should come up. ...is that how HOTUKD makes it's money then? I am capable of searching for stuff. Just letting the OP know that the link provided does not work. Sorry, must have missed the part of HOTUKD where by we just share the … Sorry, must have missed the part of HOTUKD where by we just share the name of products and tell people to find them......is that how HOTUKD makes it's money then? I am capable of searching for stuff. Just letting the OP know that the link provided does not work. Quiet a few links to deals don't work. It's just the way HUKD links to them. If you look at the link, it's correct, just gets reset to the home page when HUKD does it's thing. is not expensive. seems pretty decent value to me. looks like is would be quite hardy. We have just bought two in the Newcastle store (loads left) buy one get one half price so worked out around £52 each. Perfect for beginners. Have some heat.